Ruaha National Park is one of the most amazing ‘real wilderness’ parks of Africa. 10,300 square kilometers area, 10 hours drive away from Dar es Salaam, the Ruaha is now the largest national park in Tanzania and home to more than 10, 000 elephants making it the largest population of jumbos in any East African National Park. This park is situated at Central Tanzania, yet it is in the Southern Touristic Circuit and always incorporated in the southern Safari itineraries along with Udzungwa and Mikumi. The lifeblood of this spark is the River Ruaha from which also the park derives its name. This river ensures a year round supply of water and also makes the center stage of the wildlife action as the predators try to make a living from the prey who risks life to get this necessity in the form of water which they can not do without. 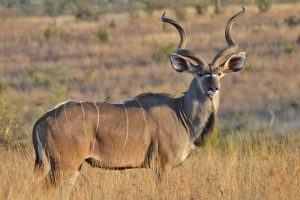 Animals found in this park vary from the small to the largest, including the grants gazelles, the lesser kudus, the roan and the Sable antelopes, the elands and as well as the greater kudus among many more species. The predators include lions, spotted hyenas, but the most highlighted is the rarest and the highly endangered African Wild dog. You can pray for your luck when entering this national park and emerge having spotted the African wild dogs in their natural habitat. More than 450 species of birds; residents and migrants alike, have been spotted in this vast national park and so for the birders, take out your binoculars, cameras and spotting list for the likes of the crested barbets, the elegant yellow-collared love birds and the rare ashy starlings. Once again if you are after the isolated African bush undiscovered by many why not contact us any we shall make your dream come true. Apart from the normal game drives travelers can get involved in off the car walking safaris and hiking though the untouched African bush.